365it PMO Mix Proof Valve - R-Cap Process Equipment, Inc.
Pentiar Südmo’s 365it™ PMO Mix Proof Valve allows full seat cleaning with product in the opposite pipeline, resulting in increased production time and greater flexibility to use available tanks and equipment. This re-engineered Mix Proof Valve, which features the same one-piece machined body and full port vent design of Pentair Südmo’s original PMO Mix Proof Valve, assures there is no possibility of cleaning chemicals contaminating the opposite pipeline of product during seat cleaning. 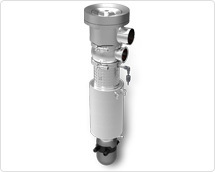 In addition, this valve completely cleans the stem during the seat lift operation, ensuring that the area of the stem that is exposed to product is also fully exposed to cleaning chemicals.